Ok so I have to admit, I only just found out yesterday that it was Mother’s Day this Sunday. I could have sworn it was next weekend, what an idiot. So I must apologise for the lateness of this post! 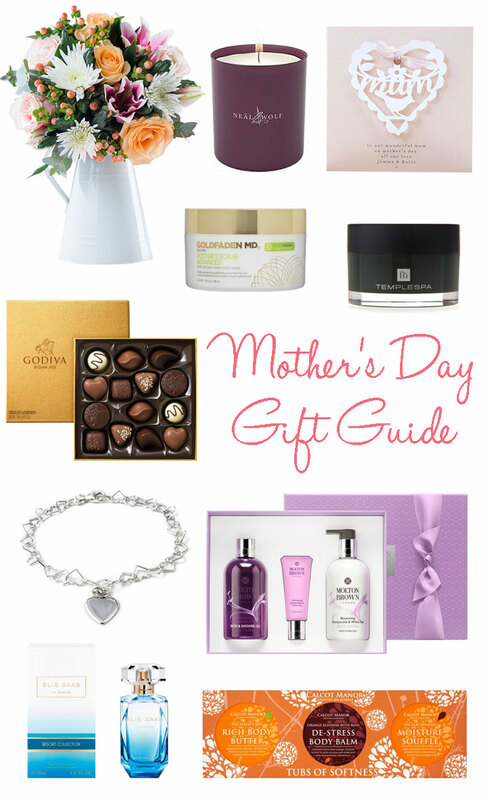 Firstly, you can’t go wrong with flowers for Mother’s Day, can you? This lovely bouquet from Appleyard Flowers includes pink sorbonne oriental lilies with avalanche roses and blush sugar flair hypericum. And what about candles? I can’t get enough of candles at the moment and one of my current favourites for a pamper evening is the Indulgence Scented Candle from Neal & Wolf, it has a beautiful and relaxing scent. If you’re looking for skincare gifts, this Calcot Manor Tubs of Softness Set from Tesco is a fantastic bargain, but if you’re happy to splash the cash I’d highly recommend the beautiful Repose Night Cream from Templespa – this beautiful aromatherapy resting cream is specifically made to calm your skin and your soul. It’s rich in natural plant extracts, anti-oxidants and contains a fusion of relaxing essential oils to leave the complexion ultra-smooth and settled. Another option is the Goldfaden MD Doctor’s Scrub Advanced from Space NK, this is a deep penetrating exfoliating treatment for oily prone complexions that really does reveal clearer-looking skin. I always make sure I give my Mum a card for Mother’s Day. She’s always said she doesn’t mind about a gift but she does like a nice card! This beautiful Personalised Papercut Card from StudioSeed combines sophistication with pretty details, I know she’ll love to receive this! Carrying on with more traditional gifts, what about this gorgeous Silver Linked Heart Bracelet from Tales From The Earth? Or the mouth wateringly delicious Gold Collection Chocolate Selection from Godiva? Jewellery and chocs are always greatly received on holidays! And lastly, my favourite perfume right now – Resort by Elie Saab from Selfridges. If you haven’t yet, you need to try this! It smells exactly like an exotic holiday and I really can’t get enough of it. And on that note Molton Brown’s Blossoming Honeysuckle & White Tea Body Gift Set would also make a fantastic gift, I love Molton Brown’s scents, they really do give you the most luxurious bath and leave me in a contested happy mood for the evening. There are some lovely gift ideas here. I haven’t got anything for my Mum yet – I need to get a move on! Went for the Repose for my mother in law she loves it. She’s 84 and says it makes her skin feel so much smoother.